Mighty Blaster Fireman Nozzle is the garden hose sprayer attachment that will transform your hose into a variable super powered water tool. 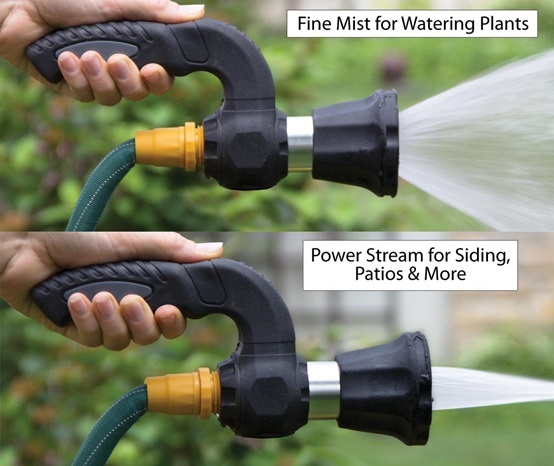 The Mighty Blaster can adjust from a fine mist for watering plants to a powerful stream. With more power than a traditional nozzle, Mighty Blaster will blast away dirt, twigs, leaves, mud and mildew from sidewalks, patios, siding, driveways, and more. Made of aircraft-grade aluminum and stainless steel, Mighty Blaster also features a comfortable grip to refude arm and wrist fatigue. Works with any standard hose.